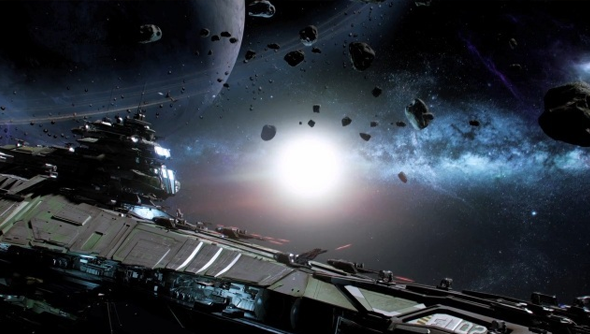 Star Citizen hits $24m adds public transport. Monorail! Monorail! Monorail! It may not sound like much but Star Citizen’s latest stretch goal, a public transport system to get you about on planet and between worlds, I think, is one of the best yet. Instead of simple fast travel between locations you can hop on a tram and travel across the surface of an alien world, admiring the sites out of the window. I want to do some virtual futuristic train spotting and, until the release of Train Simulator 2234, this is the best looking way to do it. Not interested in public transport? Then you may be more interested in the newly announced goal at $26 million. Usually you’ll be travelling between worlds by starship but if, for whatever reason, you don’t have one then the galactic transportation system will be your best friend. You can use it to move your person or your items between hangars, planets, and systems. There was already elements of transport in place but this goal adds star liners, long range transports, charter ships and flyable shuttles. Also, at this point it is customary to point out that Star Citizen is sucking in all the world’s money. Want to know the real reason why the US government shutdown this month? Look no further than Star Citizen’s pledge counter.